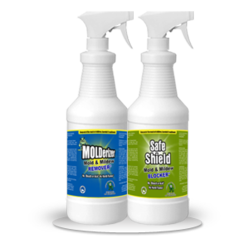 Molderizer made available to the public is two non-toxic mold remediation products. With them, the company promised homeowners and mold contractors a greener and safer mold treatment. Because the solutions are non-toxic and odorless, house members don't need to evacuate from the area treated. The use of mold remediation products offers a convenient way to clear out mold. However, most of today's commercial mold solutions contain chemical elements that present risks to human health and even the environment. So to provide homeowners and contractors a safer means to clean the spores, Molderizer.com went a different way in producing its mold sprays. There are several problems associated with mold presence. For one, it degrades the aesthetic value of items and structures that it invades. It also causes allergies to those people with weak immune system. And basically, those two major problems that it brings lead to more spending as its damaged pieces surely requires treatment or replacement. The victims of the allergies it causes also simply got no choice but to get it treated. To prevent those problems that mold can bring, the best that anyone can do is to prevent its presence. But the thing is, mold growth is triggered by moisture. And because moisture is almost anywhere at any given time, there is always the possibility of mold infestation. Nonetheless, though it's quite difficult to prevent mold presence, Molderizer.com said that it is doable. However, in case it gets past one's preventive measures, the site stated that there are always mold remediation products that could make their removal an easy work. And if a mold victim wants an even easier solution to the problem, it said that there are now mold contractors who offer their services. However, Molderizer.com believes that mold removal must be safe apart from effective. So to homeowners and mold contractors alike, it recommended the use of non-toxic mold remediation products. For its part, the online company formulated its mold solutions with natural ingredients. The fact that harsh chemical ingredients are absent in the company's products are basically what makes them among the best, if not the best, solutions that anyone could purchase. In fact, that enables them to benefit not only human health but also the environment. Because the solutions are non-toxic and odorless, house members don't need to evacuate from the area treated. That makes the mold clean-up a hassle-free process. But more importantly, that non-toxicity saves the users and anybody else that could be exposed to products from several health risks as allergies, poisoning and difficulty in breathing. Nature is also benefited as the solutions do not add more pollutants to the environment. In addition to that, Molderizer's products also help boost the profit of mold contractors. Particularly, it's because the use of it offers more benefits. And that makes it more appealing to mold sufferers. The products, Molderizer and Safe Shield, can also do the work of several employees as they can clear mold without brushing for hours. And that reduces mold removal cost. But Molderizer understands that consumers almost always doubt new products. So to show that the solutions can indeed deliver their claims, the company decided to give out samples of them.